Avoice teacher and ardent follower of the teachings of Rudolf Steiner, W. Henri Zay (1869-1927) was a young man of twenty when he left Cleveland, Ohio, to study with William Shakespeare in London—the latter a leading voice teacher of his time as a result of his studies with the Milanese maestro Franceso Lamperti. 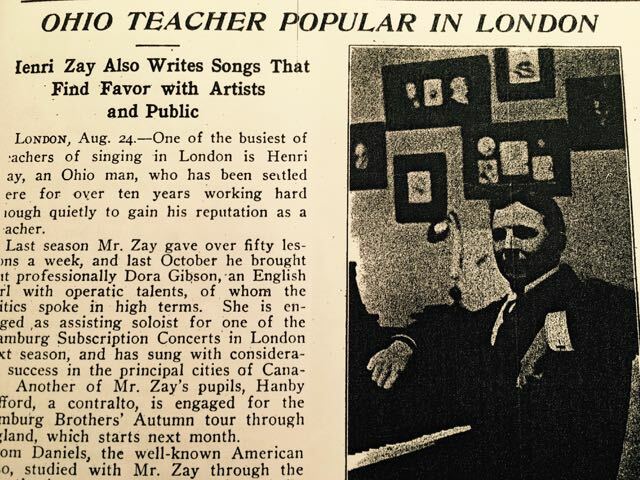 Records indicated that Zay approached his studies with Shakespeare with the intent to teach voice, which he did shortly after breaking with his master about 7 years later, having served as Shakespeare's assistant and coming into contact with many musical luminaries. 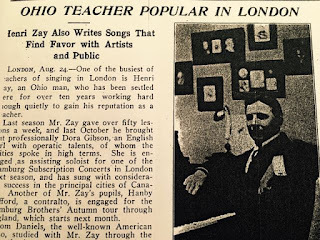 Zay—a baritone—taught in London for twenty years, quite successfully it seems, before returning to America with his British wife in 1916 and writing the book that would bring him a great deal of success as a voice teacher in New York City. 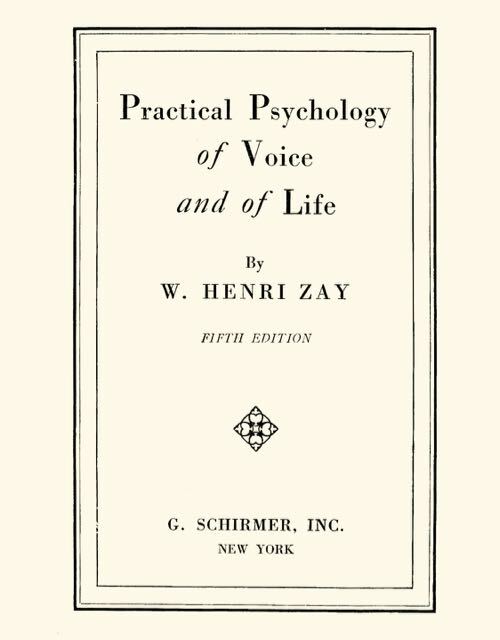 Touted as an original method when it was published in 1917, Zay's Practical Psychology of the Voice and of Life was noted for "combining the principles of the Italian school of Bel Canto with the true French school of Masque Resonance," but what Zay really did was tap into the zeitgeist of his time—psychology and self-actualization being all the rage—while imparting technical information that was taught by exponents of Francesco Lamperti and Manuel García (notably Anna E. Schoen-René) and later surfaced in William Earl Brown's book Vocal Wisdom: The Maxims of Giovanni Battista Lamperti in 1931. There is no English equivalent for the French word "timbre," so we must frankly appropriate it, as something which ought to be added to the general good, for in this manner the English language was formed. Also the English-speaking-race—but that is another story. What is the "Timbre"? It is difficult to describe; as mentioned before, it arises out of the principle of "liaison" in the French Language. The old Italians were careful to make all notes join, but the timbre is something more; it suggests an enveloping overtone which comes to a rounded point in the forward dome of the face, "dan le masque," as the French say. There is a strong vibration felt in the masque of the face, at a point immediately back of the nose, just under the eyes. I do not quite like to call it the hum in the voice, as the rather implies weakness, while the timbre gives strength; it is the forward humming ring, or ringing hum, which gives intensity and carrying power, solidity and character, whether the voice is loud or soft. It is powerful and insinuating, making it possible for the voice to be heard through a mass of orchestral sounds. It is the ring in the voice, the opposite of the shout. It is the natural overtone which bears the same relation to the fundamental tone as the spirit does to the body; it is the astral body of a tone, which carries the message from the singer to the audience. It gives the divine spark, which kindles sympathy in all within hearing, and its presence assures the singer that there is complete connection between his inner soul-forces and his outer means of expression. Without it no real expressive artistic singing can be done. Henri W. Zay. 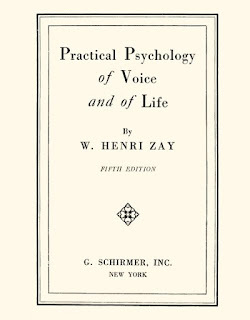 Practical Psychology of Voice and Life (Schirmer, New York), 1917: 24-25. Zay's genius, of course, was to take an old teaching and illuminate it in a new way. As such, the author gives the reader practical instruction towards attaining his outlined thesis, which entails a careful study of vowels. You can find Practical Psychology of Voice and of Life here and on the download page in the right-hand column. You can't miss it, since entries are filed according to the alphabet, and Zay is at the bottom of the list since it starts with a Z.
Zay died after contracting a severe cold and suffering a heart-attack at the age of fifty-seven. He left a wife and four children, one of whom became a noted sculptor.